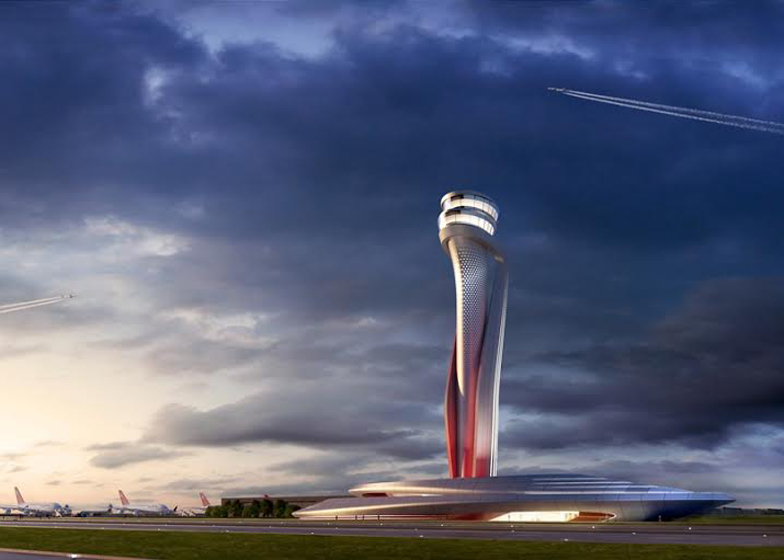 Pininfarina and AECOM have beaten proposals from Zaha Hadid and Moshe Safdie in a contest seeking a design for an air-traffic control tower at Istanbul's new airport. Pininfarina, an Italian design studio, and AECOM, a global architecture and engineering firm, were selected ahead of five other shortlisted teams in the competition, which also included Fuksas, RMJM, and Grimshaw and Nordic – the architects designing the rest of the airport. It features a curving tower that will serve as a landmark for passengers flying in and out of the airport. The shape of the structure is intended to reference the tulip – a symbol of Istanbul. "In this competition, our aim was to combine the dynamism and romance of Pininfarina's architectural style that is so influenced by automotive design with AECOM's in-house aviation architecture capabilities," said AECOM's Jennifer Dixon. "The AECOM and Pininfarina team has created a beautiful and highly functional piece that rekindles the excitement and glamour of modern air travel at the crossroads of Europe and Asia," she added. Designed by Grimshaw, Nordic Office of Architecture and Haptic, Istanbul New Airport will be the "world's largest airport terminal under one roof"
"The Istanbul ATC for the New Airport is an iconic building, destined to become a landmark for Istanbul," added Pininfarina chairman Paolo Pininfarina. Pininfarina is best known for its transport design, and has worked with agricultural machinery manufacturer Zetor on a Ferrari-style tractor, as well as train designs for Eurostar. Earlier this year the company was bought by Indian conglomerate Mahindra. "Our aim, as with all our projects, was to develop a bespoke idea that embodied our partner's design identity while at the same time bringing a new aesthetic perspective," added Pininfarina. "By leveraging the unique combination of our 85 years' experience in design – from cars to superyachts, and from luxury products to furniture – with our architectural knowledge gained from several projects around the world, we have been able to create a technologically advanced structure of distinctive character." All six entrants were tasked with creating a contemporary and sustainable design that reflects the culture and heritage of the city. AECOM and Pininfarina's winning design will be built at Istanbul New Airport, a six-runway structure that will house the "world's largest airport terminal under one roof". The airport will be located 20 miles outside the city on the Black Sea coast, and will be built in four phases with the first expected to open in 2018. "One of the world's largest aviation projects, Istanbul New Airport's air traffic control tower will be an iconic structure, visible to all passengers travelling through the airport," said Yusuf Akçayoğlu, chief executive officer of İGA. "We were looking for a striking design fit for a 21st century airport while remaining sensitive to Istanbul's unique heritage," he added.